WILLEMSTAD - Former Prime Minister Gerrit Schotte states that the financial designation of the island done by the Kingdom Council of Ministers in 2012 was a political move with the aim to overthrow his government. “Aruba’s national debt has doubled in five years from 2.2 to 4.6 billion, while the Netherlands is silently watching,” the MFK leader said. Schotte believes that there is a double standard. While Aruba is working itself further into debt, Curacao got a financial designation imposed two years ago. "Prime Minister Mike Eman of Aruba called it a 'phase' where Curacao, as a new independent country, must go through,” Schotte said. Prime Minister Mark Rutte added that an orderly implementation of the agreements reached in 2010 was crucial. 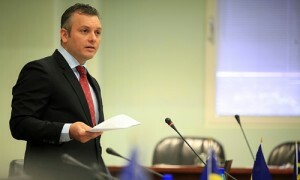 No balanced budget for 2012 is a serious offense, especially for the people of Curacao. We are therefore highly motivated to maintain this measure. According to Schotte, it is strange that the government of Aruba as doubled its debt, which has been built up in 23 years, in a matter of five years. “The national debt of the island has increased from 55 to 98 million and was labeled as a 'serious matter', where intervention was deemed necessary.” Schotte find that remarkable. “If this is a serious matter, how should we call Aruba’s debt then?" The former prime minister says that this proves that the designation of Curacao a political move was to overthrow the government.